Cooking for Crowds will take place Thursday, April 25. FARMINGTON - University of Maine Cooperative Extension in Franklin County will offer a food safety training for volunteer cooks April 25, from 9 a.m.-12 p.m. at the University of Maine Extension office, 138 Pleasant Street, Suite 1, Farmington. 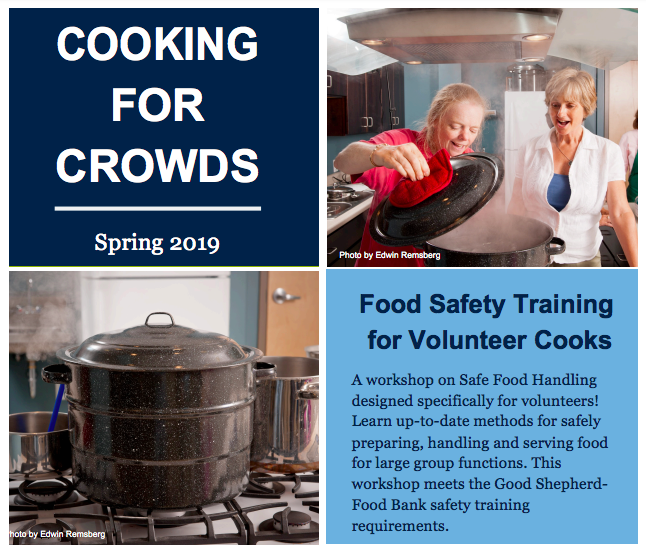 “Cooking for Crowds — Food Safety Training for Volunteer Cooks” offers up-to-date information on how to handle, transport, store and prepare foods safely for large group functions, such as soup kitchens, church suppers, food pantries and community fundraisers. Participants receive “Cooking for Crowds,” a manual designed for volunteer cooks; a certificate of attendance; posters; and an instant-read thermometer. This class meets the Good Shepherd Food Bank food safety training requirements. The $15 per person fee includes all materials; limited financial assistance is available. Register online. For more information or to request a disability accommodation, contact Tiffany Wing, 207.778.4650, tiffany.wing@maine.edu. University of Maine Cooperative Extension: As a trusted resource for over 100 years, University of Maine Cooperative Extension has supported UMaine's land and sea grant public education role by conducting community-driven, research-based programs in every Maine county. UMaine Extension helps support, sustain and grow the food-based economy. It is the only entity in our state that touches every aspect of the Maine Food System, where policy, research, production, processing, commerce, nutrition, and food security and safety are integral and interrelated. UMaine Extension also conducts the most successful out-of-school youth educational program in Maine through 4-H.